My roommate and I collaborated on this spinach and broccoli quiche recipe one night, after work, when we were both looking for something quick, simple and healthy. Paired with a fresh salad, this is one of my favourite meals. It is easy to keep in the fridge and transport to work for several days of lunches. I also love it as a lite dinner option. This recipe was passed down to me from my mother, who was taught by my grand-mère. Start with a simple crust. Here are two crust options- one with shortening and one with butter. This is helpful if you are throwing something together, working with what you have in the fridge. Measure out the water and put in the freezer. Break up the fat (shortening or butter) into the flour with your hands until the mixture is a mealy texture (lumps about pea size). 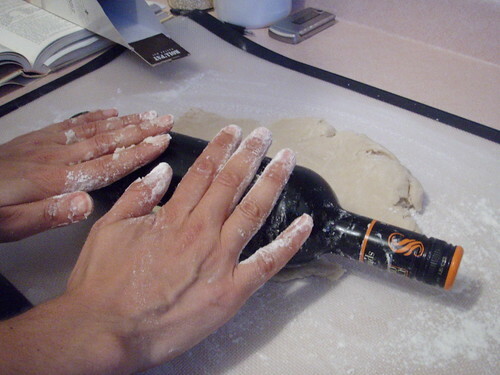 Add the water until the dough forms into a ball. Add more water (2-3 tbsp) until the dough entirely sticks together. Turn it out onto a sheet and knead until it is the correct consistency (smooth and pliable). Do not over knead the dough! Refrigerate for at least 1 hour. 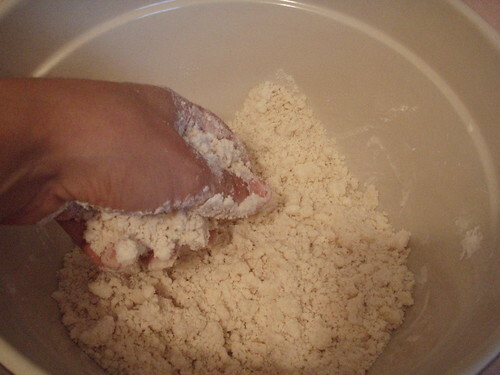 Use the heel of your hand to flatten out the ball of dough, then roll it out until it is about 1/4 to 1/2 inch thick. Line a pie dish with the dough, pinch around the edges and cut away any extra dough. Lightly bake at 350°F for 5 minutes. 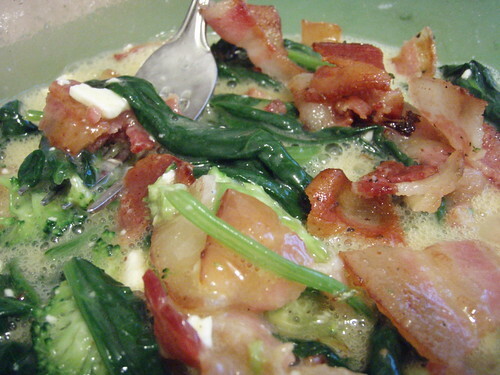 Fry up the bacon, remove from the pan and then sauté the onion and garlic in the bacon drippings. Add the broccoli and spinach. Starting with just the eggs, whip together the ingredients with a fork. Pour into your prepared raw crust and bake at 350°F for about 30 to 40 min or until the filling begins to rise and the top begins to lightly brown. For a fun lunch idea, get some small or medium sized aluminum tart dishes. Split up the crust and filling into the dishes to make mini quiches that are perfectly packable for a cold or warm, work or school lunch. 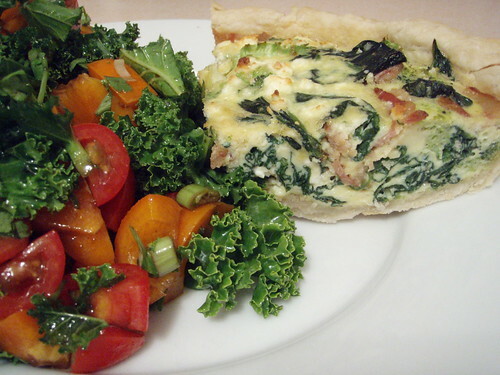 I paired a coriander and kale salad with this quiche. To make it, roughly chop together some coriander and kale. Cut grape tomatoes in half, add them to the greens. Add orange pepper and finely chopped green onion. Dress with a light sprinkling of extra virgin olive oil, juice from half a lemon, a table spoon of white wine vinegar, salt and pepper. I derive endless inspiration from food and cooking, and created this blog to share some of my favourite recipes. I'm always experimenting with healthy alternatives, and have lots of delicious, easy to prepare, packable lunch ideas. Enjoy!